Hospital operating rooms and surgical areas are required to meet strict hygienic requirements. Florock’s flooring solutions are an ideal choice for promoting a clean and sterile environment in any O.R. facility. Our seamless flooring systems are especially formulated to be bacteriostatic to minimize the spread of microbes or disease. 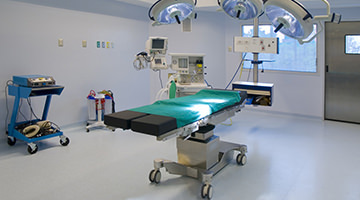 When it comes to creating a sterile environment, operating rooms require a reliable flooring solution that will discourage the reproduction and spread of harmful microorganisms. Florock manufactures floor coatings that are especially designed to meet the needs of an active surgical area. Your operating room and surgical areas are crucial parts of your institution or facility. The proper hygienic flooring system can help your staff focus on your patients’ health and not on maintaining their floors. Not all flooring systems are created the same. Florock’s specially formulated flooring systems for operating rooms are seamless, with none of the heat-welded seams found in vinyl sheeting floors that can form micro-cracks over time – places that can harbor bacteria or germs. Superior compressive strength ensures that heavy point load permanent and wheeled equipment can be properly supported. We also offer unique solutions for slab-on-grade O.R. facilities, where moisture vapor transmission rising up from underneath the concrete slab can be a challenge to standard flooring options. Our FloroProof System’s ultra-high performance underlayments are specially designed to combat the highly alkaline moisture vapor that can cause delamination and disbondment of almost any type of floor covering, including sheet vinyl, laminates and even traditional resinous flooring. The ability of FloroProof to ensure the bond of the O.R. flooring system to the concrete slab in the face of less than ideal environmental conditions provides priceless peace of mind. It also greatly reduces the risk of having to close down the operating theater for floor repair or replacement upon discovery of infection-promoting delamination, cracking or other flooring damage. Superior bonding and the ability to withstand high pH levels and moisture within the slab, make our flooring systems the perfect solution when maintaining a bacteriostatic and fungistatic operating room. 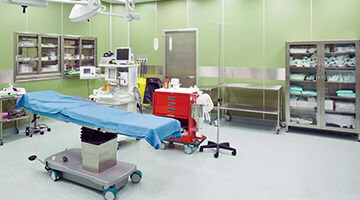 Learn more about our flooring solutions for operating and surgical rooms.